Despite running into issues such as winter storm Goliath, construction crews working on the 13th Street Reconstruction Project are expected to complete Phase One on schedule. 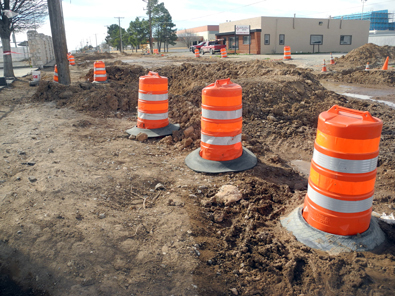 In early December, crews began the first of five phases of the portion of the project running south of Main Street, tearing up 13th Street from Main to Grand Avenue in order to replace the asphalt, sidewalks, sewer lines, water lines, drop inlets, and storm drains. Goliath halted construction, as the snow and ice prevented the crew from working. This caused a three-week total delay from the original schedule. However, as of last week, the crew is back on schedule. The first phase is expected to be completed June 1. “Contractors are progressing very well on the project,” said Byron Landfair, infrastructure director for the City of Artesia. The next phase of construction will stretch from the alleyway behind Terry’s Electronics to 200 feet north of Main, including the intersection of 13th and Main streets. That intersection will be replaced with concrete as opposed to asphalt during due to the heavy traffic flow the crossroads receives on a daily basis. This phase is planned to last approximately three months. U.S. 82 traffic travelling through town will be detoured to 26th Street, Richey Avenue, and First Street. The following three phases will last another 12 months, meaning construction should be complete by September 2017. Drivers are urged to pay close attention to construction signs, detour signs, and business access signs, as well as to use Seventh and 20th streets to navigate around the construction project.